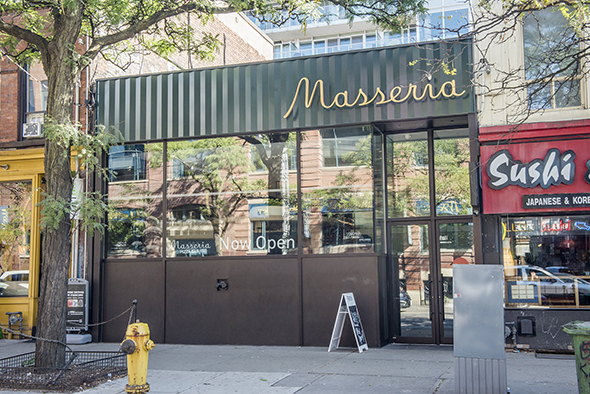 Masseria is an Italian restaurant at King and Portland in an area known for its abundance of drinking and dining options. Already home to Buca , Wvrst , Home of the Brave and many more, you need to be able to punch your weight to earn a spot here. Thankfully the chef has over a decade of experience with Mark McEwan. 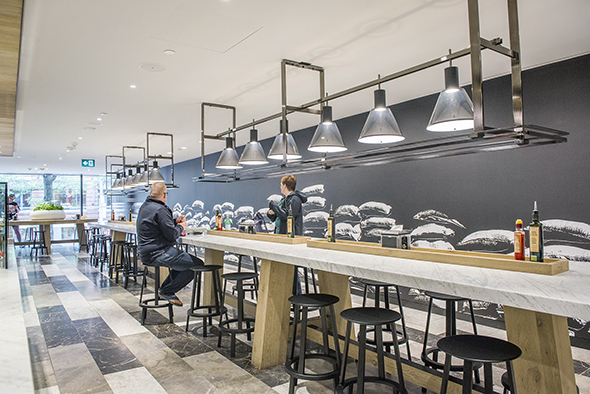 The interior really speaks to the casual but upscale feel of the restaurant. 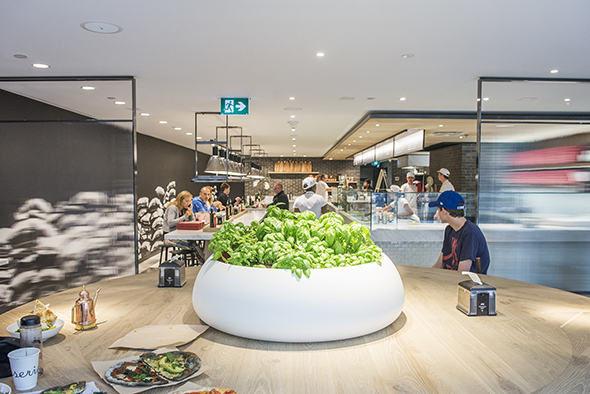 You order at a lunch counter from a variety of hot and cold dishes, from made-to-order pizza to sandwiches and salads that rotate daily. Seating is communal, but the two long tables and one big round table are spacious enough that you don't feel like you're eating face-to-face with strangers. Their pizza oven was made in California by Wood Stone , and they had to bring it in through the window. 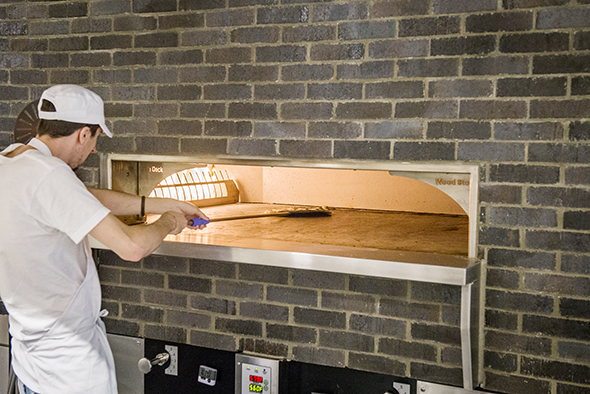 At twenty-two square feet, this oven can fire fourteen pies at once. 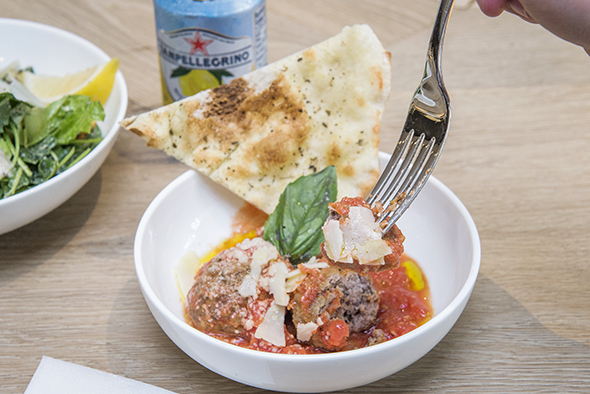 The polpette, or meatballs, come in at $9 for 3, but it comes with two pieces of bread and they're lovingly made by hand, soft enough to cut with the slightest pressure of a fork. The beef, pork and veal ball is cooked in the oven then placed into the tomato sauce made from tinned Italian tomatoes crushed by hand. Let's get down to the pizza! We get two pizzas on "carbone" dough, blackened with charcoal that doesn't add any flavour, but apparently does create lightness in the dough. 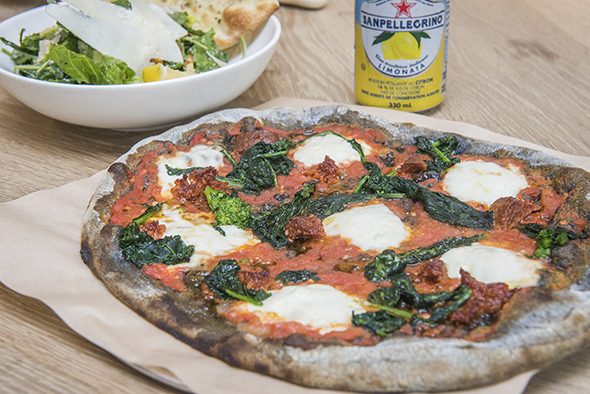 One is the San Giovanni ($19) topped with tomato sauce, fior di latte, 'nduja and rapini. 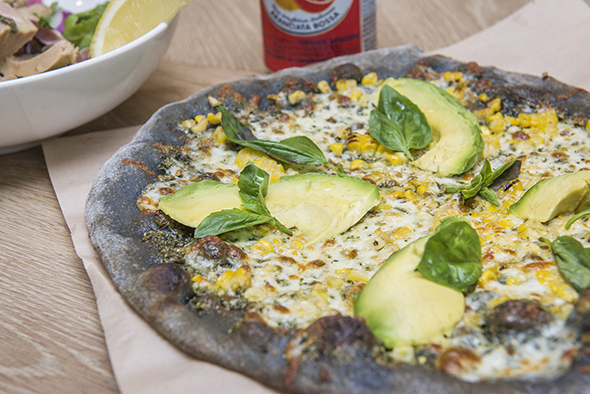 The other, a carbone di giorno, gets basil pesto, Ontario sweet corn, mozzarella, basil and avocado. 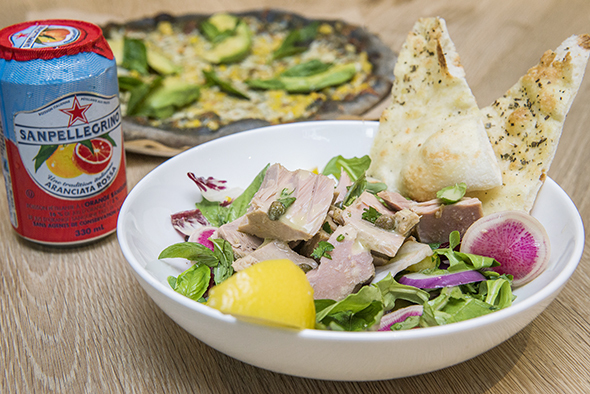 They do salads if you're not a pizza fan: there's the tonno ($14), radicchio and arugula topped with watermelon radish, pepperoncini, yellow bell pepper, capers and chunks of whole loin Italian tuna. The obligatory caesar ($11) opts for a mix of baby kale and romaine with a vinaigrette, smaller croutons and parm. 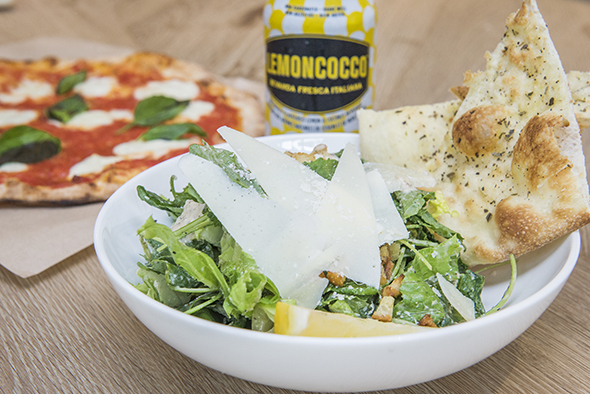 Both salads come with bread (you're not getting out of that one). 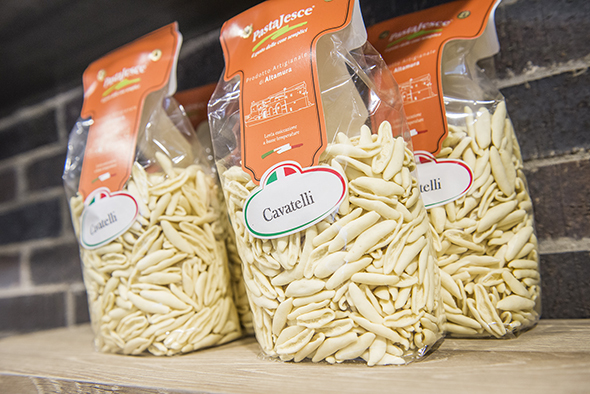 Masseria also retails specialized Italian products, like this cavatelli for $9. Complimentary lemon water is a nice touch, though you can refresh yourself with anything from Station Cold Brew ($5) to Lemoncocco ($4) to a Peroni ($9).